Fortran and IBM were symbols of authority-controlled mainframe computers, unavailable to the the public. Bob Albrecht, a founder of the People's Computer Company, considered FORTRAN a stifling and boring programming language. 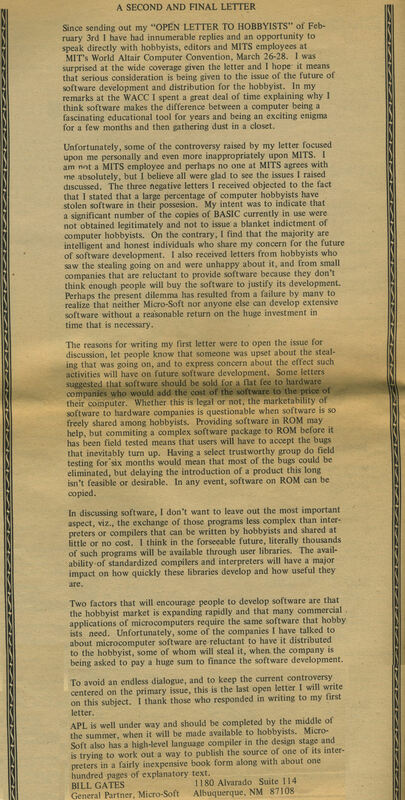 Bob undoubtedly influenced the opinions of the authors of Fortran Man. Gates and his company Micro-Soft (later Microsoft) in the mid 1970's. ".. 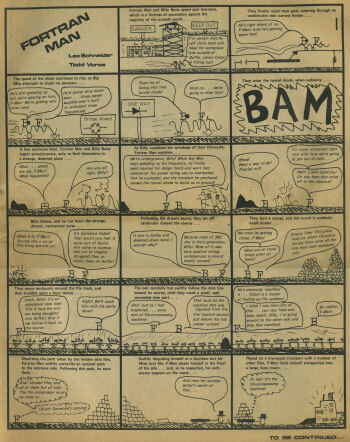 Saw your notes on PCC magazine from the '70s and feel obligated to correct the history a bit -- Fortran Man was created as a pastime doodle while studying for my tech degree, and was sent to Bob Albrecht as a bonus along with an article on the Kingdom game (expanded from the original DECUS version) he had asked us for. There was never any "political commentary" intended (nor did I even know who Bill Gates was at the time). I know this because I am the original author of both Kingdom and the Fortran Man comics. Todd & I are still alive and well and computerizing in Milwaukee. 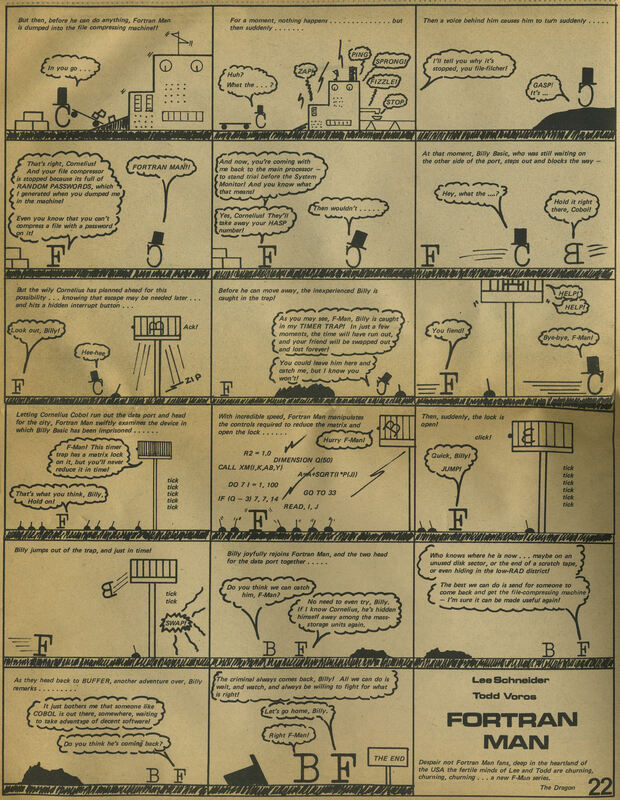 The objective of Fortran Man was to include as many bad hardware & software puns as possible into each frame. My sketches were originally created while sitting in the back row of boring lectures at MATC (Milwaukee Area Technical College, where I was getting my Computer Tech degree before transferring to UWM Engineering) -- since all of our software homework was done in Fortran (thru an IBM 1130) the name "Fortran Man" was obvious, and being a Batman fan I knew he needed a sidekick to explain things to, so I went with the other up-and-coming language of the time, Basic (and in true Stan Lee fashion, initials had to match, ala Peter Parker, et al). At the same time Todd was going for his Software Engineering degree at Marquette University, within walking distance of MATC, so we would often meet up for lunch and I would give him copies of the latest F-Man to post on the MU Computer Center bulletin board (we had initially met at the M.U. Science Fair in 1969 while still in High School). BTW: the game "Kingdom" was based on a DEC demo game called Hamurabi, which I expanded on and added a number of features, but the goal remained the same -- resource management of land, grain & peasants until you acquire enough to "rule the world". After our DECUS article we ended up sending copies to requestees all over the country, Canada, and at least one place in Scotland. One copy went to a Navy Lieutenant in the Pentagon, who wrote us back that once on their system he couldn't get any work done over lunchtime because all the Army brass was sitting at the terminals playing and griping about how they couldn't call in an air strike when the Huns attacked their border. 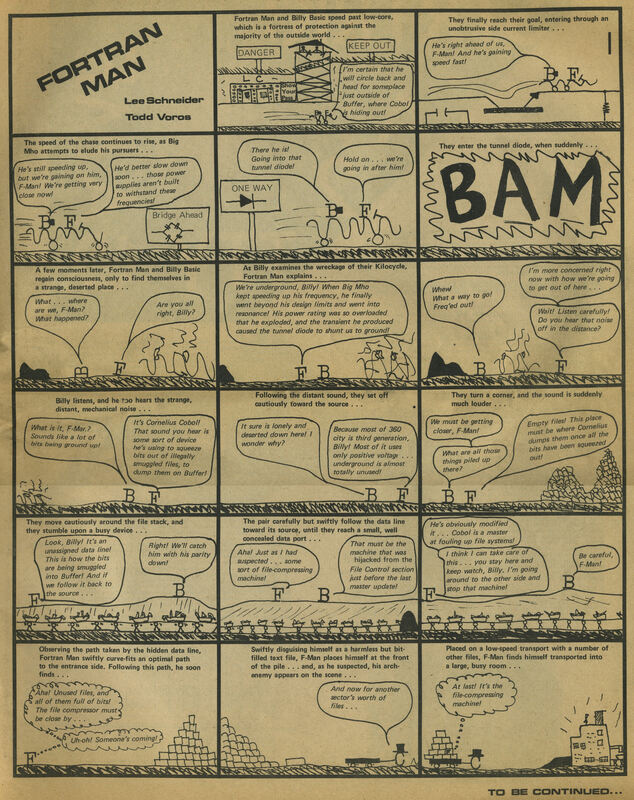 Kingdom also had the distinction of being the first program banned by the Marquette Computer IBM360 timesharing center, because students playing it were hogging computer time and nobody could get their homework done (they later relented and allowed it to be played, but only after 10pm). Remember, this was 1971 -- the infancy of computer gaming. Also BTW: I still have several ADDS terminals in my basement. Feel free to pass along this info wherever -- but realize I am typically too busy for long correspondences these days (am currently visiting friends in San Jose, before heading down to San Bernardino to supervise install of some equipment). Final BTW: if you want to see one of the strangest use of embedded computer power ever, take a look at www.pevnickdesign.com .."